A girl can only take so much academic paper-writing before she needs a creativity break. So, I decided to snap a few photos of some beautiful bowls this morning; the hot air balloons bowl that you see below (the one on the top of the stack) was just sold yesterday and I’ll be shipping it (along with the rest of the chip and dip set it’s a part of) to its new owner later today. 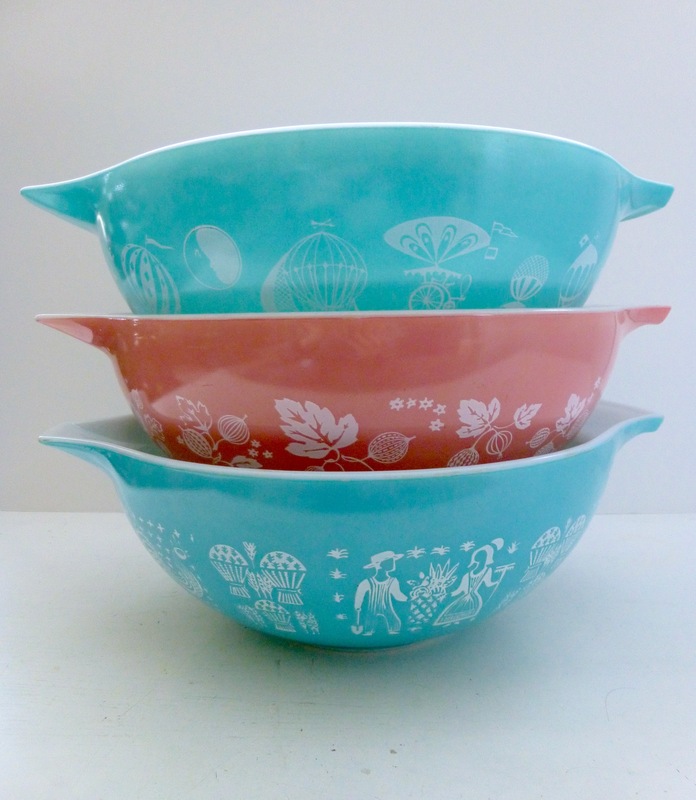 At any point in time I have some vintage Pyrex in my home, but I absolutely love these three large bowls. They’re my 3 favorite patterns (balloons, pink gooseberry, and turquoise butterprint) so I had to get a portrait of them together before they go their separate ways. Aren’t they beauties? A soothing sight for sore eyes (literally, my eyes hurt from spending so much time staring at a word document for the past week)! Once I turn in this comp on Sunday morning, I’m going to have a big breakfast, visit the flea market, and exchange gifts with my boyfriend. A light at the end of the tunnel! 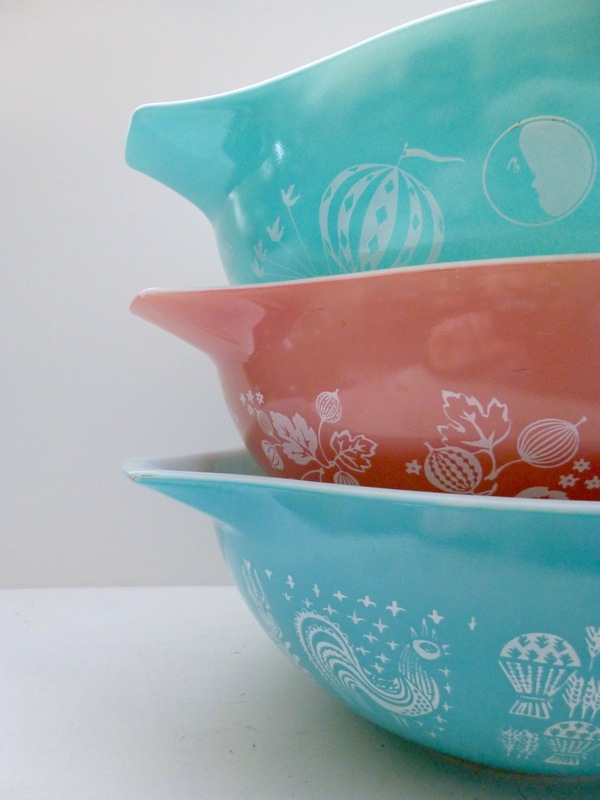 This entry was posted in Uncategorized and tagged 1950s, etsy, glassware, photography, pyrex, retro, vintage pyrex. Bookmark the permalink. Your photos are beautiful! 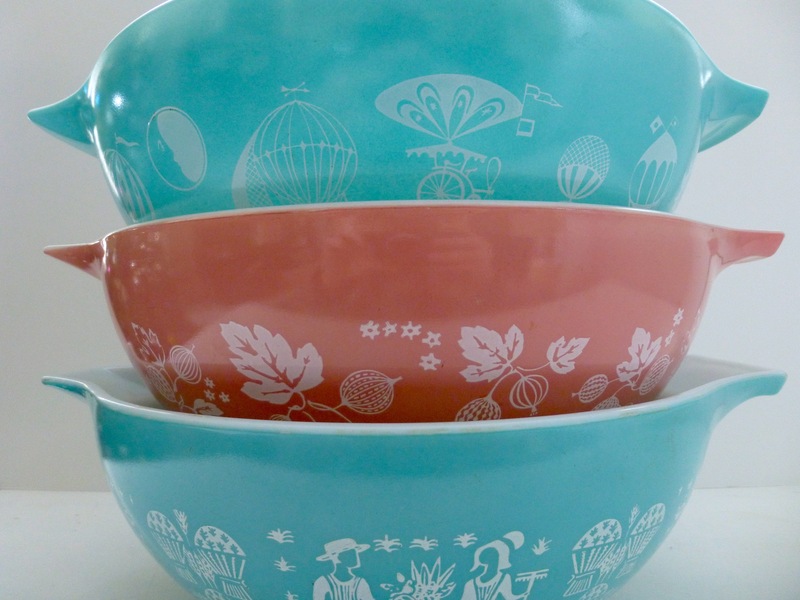 Just curious what was the size of those hot air balloons, pink gooseberry, and turquoise butterprint bowls? Thank you so much! All 3 of the bowls are 4 quarts, the largest size Cinderella bowl.